Travel can be hard on the neck, but it doesn't have to be hard on the bank account. You can make yourself a Patchwork Travel Neck Pillow to travel in style while saving some dough. Recycle your leftover fabric to make a pillow that will draw everyone's attention whether you travel by plane, train, or automobile. Learn how to make a pillow using this easy sewing tutorial. DIY crafts like this are also a great way to get your kids involved in crafting. Let them help you stuff the inside after you piece together the cover. For more DIY gift ideas like this one, check out 4 Homemade Gifts For Any Occasion + 7 New DIY Gift Ideas. I've never been trapped either...and I've gotten some great patterns and ideas. Get your facts straight please. I have never been trapped at all, it is completely FREE. Its a trap to get you to sign up for another site. A site you have to pay for to download. Same on you. 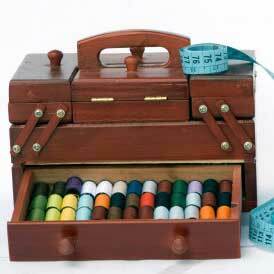 Hi Carolyn, This is actually a link to a sewing blog that offers a free pattern. If you click, "Click here for sewing pattern", then you'll be taken to the blog where the full tutorial is. Hope that helps!